Smoothies are a great way to supercharge your intake of essential vitamins and minerals for optimal health. Many smoothies that you buy in the store have added sugar or other ingredients that you might not want in your food. Making Smoothies at home will help you to avoid the added sugar and ingredients that you do not want, and you can take advantage of the hundreds of smoothie recipes that not only make you feel great but that taste great too. To make the best smoothie, you need the best smoothie maker. There are many brands that claim to be best, but only a few are capable of delivering in an efficient manner. This smoothie maker review will help you to choose the right one for you. You might be wondering what you need to know to choose the best smoothie maker UK brands have to offer. It is easy to be tempted to let price be the primary guiding principle in your purchase, but this might not lead to a smoothie maker that you will be happy with for a long time. You want to take the time to think about how often you will use it and your needs before choosing a smoothie maker. 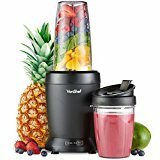 This smoothie maker buying guide will give you some suggestions on what to look for when choosing the best smoothie maker so that you can be enjoying delicious snacks soon. The first thing you need to consider its capacity. Many smoothie makers have capacity markings on the jug that will allow you to measure your ingredients for the perfect smoothie every time. If you are making smoothies only for yourself, you may not want to spend the extra for a larger capacity jug. If you are making smoothies for the crowd, one with a bigger jug capacity will make life much easier. The power or wattage rating refers to how much power is directed towards the blades. Most smoothie makers are between 300W-1000W. Smoothies often contain harder ingredients such as ice and nuts. To crush these ingredients efficiently, a higher wattage is usually suggested than would be needed for blending softer ingredients or liquids. The higher the power, the faster the smoothie maker can blend your ingredients. Most smoothie models now come with several different speed options. These smoothie makers allow you to get the perfect blend for your smoothie without liquefying it too much. Variable speeds are a nice function to have because they give you more control over the thickness and amount of pulp left in your final product. Smoothie makers tend to be loud, especially when crushing ice and other hard ingredients. You will want to look for the quietest model possible, particularly if you live in a flat where you have neighbours just on the other side of the wall. Noise is a consideration, but many smoothie makers only need to run for a few seconds. You will have to decide for yourself if noise will hinder friendly neighbourly relations. Smoothie makers require a lot of power to do their job quickly and efficiently. Improved designs mean that they can deliver the power without using a lot of energy. Make sure to look at the energy efficiency rating for the smoothie maker that you choose to ensure that it delivers the most power while using the least amount of electricity. Most smoothie makers are easy to use, but some of them come with a long list of complex parts and assembly instructions that you must follow every time that you use it. The key to starting and maintaining a good smoothie habit is to make it as simple as possible, especially for those morning smoothies that must often be made in a rush. Smoothie makers are easy to assemble in just a few seconds without much fuss or hassle. Another feature to look for is that you want a smoothie maker that comes apart for easy cleaning. You do not want one that will not allow you to clean every piece thoroughly. Look for pieces on the smoothie maker that might not be so easy to clean, such as taps or blades that are one big assembly and do not come apart. Filler cap allows you to add additional green ingredients to the smoothie while the unit is in operation. This is a great feature to have if you want to incorporate ingredients, such as oils that you want to drip slowly into the mixture. This can also serve as a measuring cup that is handy and convenient. A pulse function allows you to press a quick button and get pulses that are a few seconds each. When you release the pulse button, the fruit, and ice fall to the bottom allowing you to achieve even blending. Without having to open the lid and stir it by hand. The blade design is the heart of the smoothie maker. 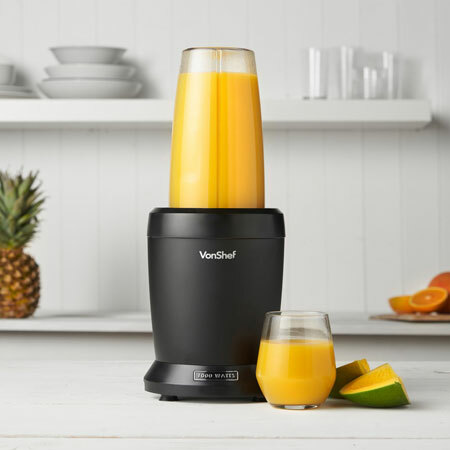 When choosing smoothie maker, newer brands for 2019 offer many improvements over the blade designs of older models. These improvements make your smoothie experience faster, and the end results are smoother and less chunky than older models. Of course, you want a model that comes with a money back guarantee if you are not satisfied. 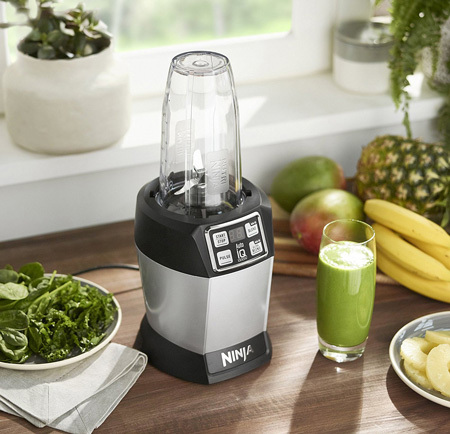 Most smoothie makers come with a one-year guarantee, but some of the high-end models come with as much as a three-year guarantee. Be sure to check the guarantee and terms as part of your considerations when choosing smoothie maker that UK manufacturers have to offer. Many smoothie makers also offer value-added features such as being dishwasher safe, additional ice crushing functions, many different types of attachments, and jugs and components that are BPA free. You will have to consider these options when making your purchase to make certain that you get the best smoothie blender for your particular needs. Safety interlock system is another essential feature. It prevents the blades from turning if the jug is not securely locked in place. This can prevent injury, and also a huge mess in your kitchen. 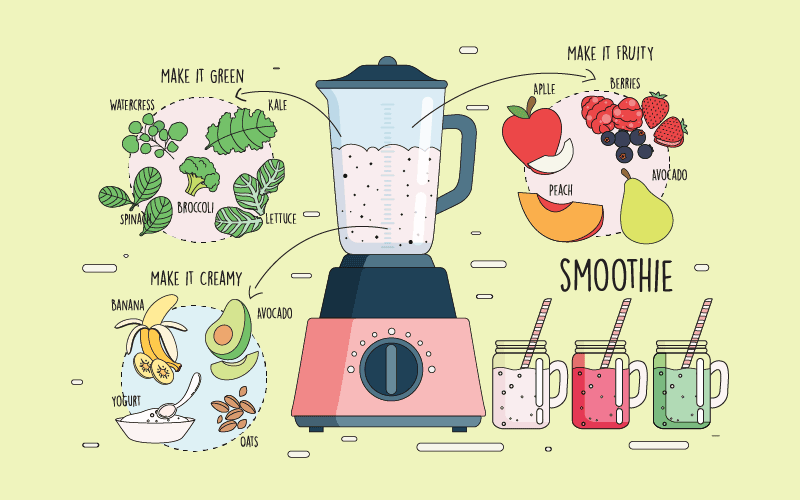 Now let us move on to examine how some of these features add up with some of the best smoothie blenders that UK manufacturers have on the market for 2019. Here are eight of the best smoothie makers available for purchase in the UK. 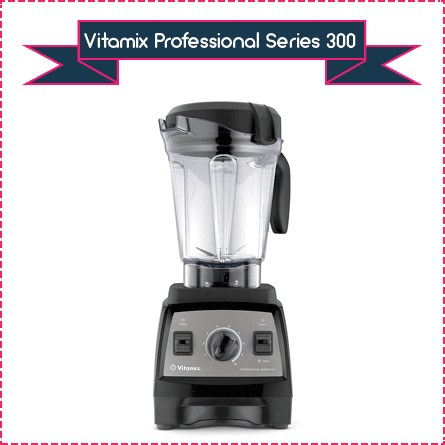 The first smoothie maker on this list is the Vitamix Professional Series 300 blender. This blender features responsive controls and a quiet 2.2 HP motor. The large 2-litre low profile jug is big enough for a family or entertaining guests, but small enough to fit under the kitchen cabinet comfortably. It features a pulse setting, making purées quick and easy. The Vitamix blender is versatile. You can make hot soups, baby food, mix flours, dough, make frozen desserts, nut butter, dressings, sauces, and not to mention, smoothies and juices. This powerful motor allows you to dice, chop, or grind whole grains. It allows you to create juices from raw fresh fruits and vegetables in under one minute. The hardened steel blades are designed to aircraft standards and a metal drive system that will make the unit last a long time. This blender is available in three colours, black, cream, and red. Vitamix Professional Series 300 blender is built to last because the company offers a seven-year full warranty. This blender is a commercial grade machine, but it will serve the needs of your home too. It features a BPA-free container. Its sleek design will look go on any counter. In the box, you will receive the Motor Base, Low-Profile 2.0-litre Container, Cookbook, Getting Started Guide, DVD, and Low-Profile Tamper. Powerful 2.2 HP motor and stylish design. It also has an overload protection which allows the machine to be protected from overheating. It comes with a seven-year warranty. It might be too much machine if all you want to do is to make smoothies. 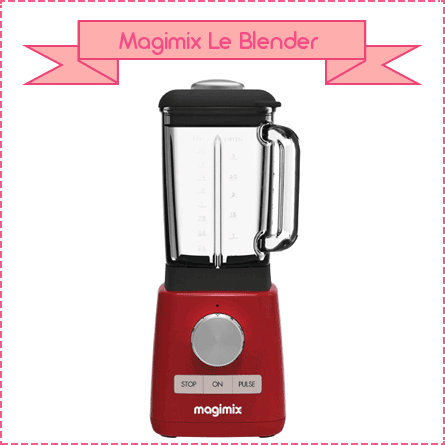 The second blender that made our smoothie maker list is the Magimix Le Blender. The best feature about this blender is that it is powerful and quiet. It features it’s patented Blend-A-Mix system for a finer blend than many other models on the market. One thing we like about this blender is that it completely disassembles for easy cleaning. Magimix Le Blender features a glass jug that is heat resistant and will allow you to prepare both hot and cold foods without worry. It comes with a lid with and measuring marks for convenient food preparation. It has a smaller mill attachment that will allow you to grind spices, purées, fine baby food, and sauces. The jug is 1.8 L, which is sufficient for most families. It has four preset programmes that allow you to create desserts, ice, smoothies, and soups with just one touch of a button. It also has settings for controlling speed numbered 1-4. This smoothie maker is easy on energy consumption. It has a 1200W motor that turns between 600-15,000 RPM, which means that it can blend and chop quickly. Its Turbo Pulse function creates a creamy texture. The pre-programmed functions will automatically stop once the function is complete.It also has a slow speed that will allow you to help fold in ingredients gently. This versatile blender comes with a three-year guarantee, which means this is a unit that you can depend on to last many years. It is available in five colours, black, white, red, cream, and stainless steel. In the box, you will find a recipe book containing more than 80 recipes and a plastic spatula. 4 preset programmes for crushing ice, making smoothies, frozen desserts and soup. Makes delicious smoothies within 60 secs. Even though it claims a powerful motor, it was unable to blend pomegranate seeds, leaving hard bits throughout the smoothie. In addition, the manufacturer recommends that the blender not be run more than 60 seconds at a time. Even though it disassembles completely, it was hard to remove the paste from under the blades after blending. The NutriBullet Rx Blender is one of the most powerful compact units that exists. It has a 2.3 HP motor and operates with 1,700 hundred watts of power. This is enough power to liquefy almost any ingredient that you can fit in it. This blender features preprogrammed hands-free smart technology and an automatic start and stop function that allows you to control the exact processing time for your ingredients. This allows you to create foods that have the optimal nutritional value and a proper blend for digestion. The powerful motor turns at 30,000 RPM. 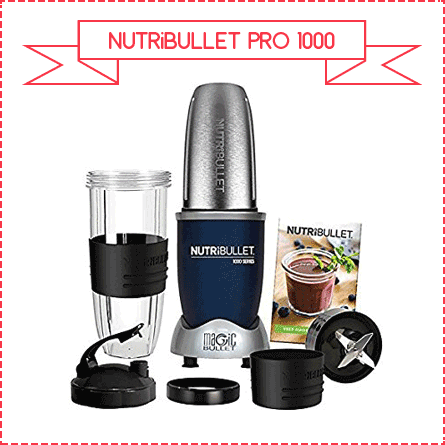 It has a one-minute Nutri Blast extraction cycle, and a Souperblast mode that allows this blender to do something few others can do, make creamy, rich soups. NutriBullet Rx Blender has a seven-minute heating cycle that lets you turn vegetables into nutritious hot soups quickly and easily. It has a high-capacity serving pitcher with a lid that is large enough for families. Advanced smart technology is what makes this smoothie blender stand out. Automatic start & stop function. Rubber gaskets have a tendency to leak. The blade is hard to remove. The belt has a tendency to slip off and leave bits of rubber in your smoothie. 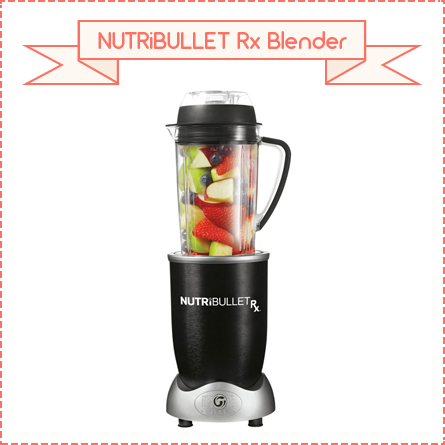 The NutriBullet RX is the first model that features built-in Smart Auto-burst cycles and an automatic shut-off. The NutriBullet 1000 speeds up and slows down at exactly the right intervals to provide the perfect blend. It features a 930 ml capacity cup that is big enough to do smoothies for the entire family. The 9-piece set comes with a power base, Colossal Cup, an 829 ml stainless steel cup, an extractor blade, ring, flip lid, and an instruction manual. It is one of the easiest smoothie makers to use. You just place the fruits and vegetables in the container and place it into the base. Now, you only lock it into place, and it does the rest. 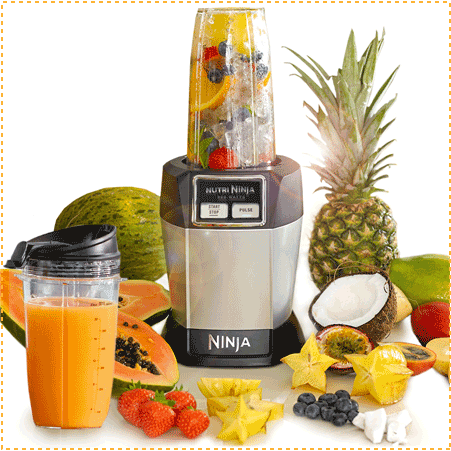 The preprogrammed modes assure that you will create the perfect smoothie every time. The 1000 watt motor uses cyclonic technology to produce smoother smoothies without the pulp. It can juice every part of the fruits and vegetables so that you can get every bit of nutrition in them. Many times the skins, stems, and seeds have important nutritional components that would be missed by other units. This unit allows you to get every bit of nutrition in the fruits and vegetables that you purchase. This 25,000 RPM motor crushes ice and breaks down even the toughest fruit and vegetable pieces easily and quickly. This is a fantastic smoothie maker and much more. 1000W motor with auto shut off feature. It is incredibly noisy and the gaskets wear out quickly. The Nutri Ninja Blender uses one touch AUTO-IQ BLEND and AUTO-IQ ULTRA BLEND Modes that allows you to set it automatically to pulse your food without you having to do it manually. The powerful 1000W motor will easily crush ice and anything else that you wish to put into it. All you have to do with this blender is to push a button, and it does all of the rest. It comes with a 500 ml Cup, 600 ml cup, and two sip and seal lids. This means that you can even prepare your smoothie and have it already in the refrigerator ready to grab and go, the gym. It also includes an inspirational recipe book so that you never run out of ideas to help you meet your nutritional goals. It features dishwasher-safe parts, is compact, and stylish. The Nutri Ninja Blender allows you to enjoy all of the most nutritious vegetables and fruits with a single touch of the button. It features patented Pro extractor blades that spin at 21,000 RPM. You can set the preprogrammed modes with a single touch. These make it nice so that you do not have to stand there and pulse the machine yourself. The cups are not dishwasher safe. The Nutri Ninja Pro is the older version of the bigger and more powerful 1000 watt model. It comes with many of the same features as its powerful cousin but at a much lower cost. It features 2 cups in both 500 ml and 650 ml capacity, and a recipe book, just like other Nutri Ninja products. Its 900 watts of power are more than enough to do anything that you would want to do. The Patented Pro Extractor Blades spin at 20,000 RPM. All parts are dishwasher safe and BPA-free, which is environmentally friendly and a good choice for you and your family. Its containers with blend and go lids are great for kids. You can also buy additional cups with sleeves and an extra-large 900 ml cup for this model. Smaller 300 ml cups are also available, which are perfect for children. This model has the power and convenience that everyone needs to keep up with their nutrition, even when there is little time to do so. It does not take much room on your counter space and is a good value for the money. It’s feet keep it securely attached to the counter so that it does not “walk” when in use. One of the cons is that it does go a little slow and is extremely noisy. It also has a hard time blending harder vegetables. The VonShef 1000 watt UltraBlend is fast, and it features a powerful 1000W motor and can reach speeds of up to 25,000 RPM. It uses razor-sharp durable blades to blend the freshest vegetables and fruits into the healthiest blended shakes. To operate it all, you have to do to turn it on is to twist the cup and lock it into place with no pressing of buttons necessary. It comes with a large and medium BPA-free cup with a spill-proof lid. The large cup is close to 1 Litre, and the medium cup is 800 ml. These are larger than many of the competitor brands. It also has a sip and seal lid that allows you to enjoy your smoothie on the go. This unit is lightweight to carry. It is also dishwasher safe. This smoothie maker can blend and crush ice in seconds. This blender is a remarkably fast and powerful and its price will not break the bank. If you do not anticipate needing something big and powerful, the Breville VBL096 Blend-Active Personal Blender Family Pack may be perfect for your family’s needs. It is affordable and made for the entire family. 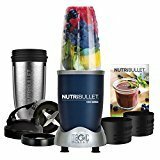 It offers one-touch blending for the perfect smoothie, shake, or nutritious berry packed slushy. 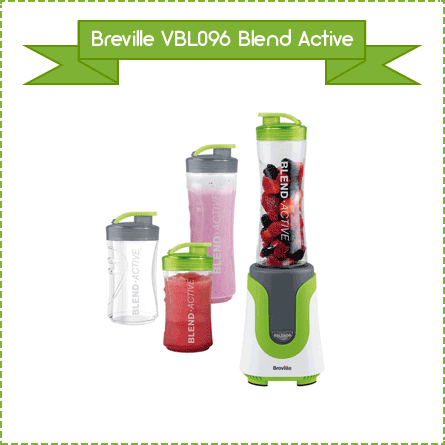 Breville VBL096 Blend-Active Personal Blender comes with two 600 ml and two 300 ml BPA-free bottles. It has detachable dishwasher safe blades, and all of the bottles are dishwasher safe too. Its 300-watt motor is plenty for most blending jobs. This is the perfect blender if you want to blend and go for the entire family. Rather than having a large blending jug, the small bottles are easy to screw and unscrew into the base. Smoothies are created in just a few seconds, and there is little mess or cleanup involved. It is also ideal for fabulous cocktails. It has a detachable angled stainless steel blade. It also offers a 1-year warranty. It does have several cons, one of which is that it leaks. The power button gets stuck inside the machine. The blade is not very durable, and the 300W motor is not powerful enough for even simple jobs. There you have it, a rundown of the best smoothie makers in the UK. As you can see, some great ones are available with some amazing features. By now, you might be wondering which one is best. The Vitamix Professional Series 300 Blender is the best smoothie maker you should have in your kitchen. This blender is fast and powerful. Regarding the best value for the money, we choose the Nutri Ninja Pro Complete Personal Blender. This blender was selected because of its grab and go convenience. It does everything all of the other blenders can do, while still remaining affordable. You can chop nuts, grind grains, or any of the other tasks that the other blenders can handle. The versatility and availability of various sized cups were another reason for choosing this model. The best cheap smoothie maker is the VonShef 1000W Ultrablend Personal Blender. A smoothie maker is a kitchen essential that everyone should have and once you have tools that you need making smoothies is quick and easy. These smoothie maker reviews will help you make your decision. With the best smoothie blender, 2019 can be your year for achieving your optimal health goals, weight-loss goals, and you can feel better than you ever have in your life. The key to all of this is good nutrition, and a smoothie maker is an excellent way to help you get there.